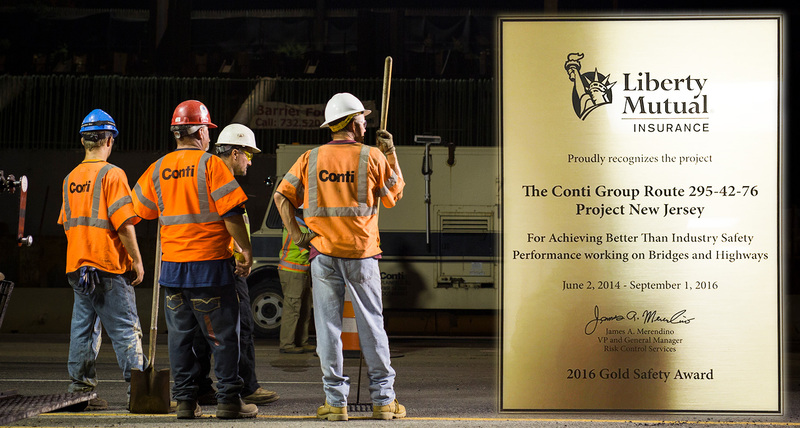 Conti has earned the Liberty Mutual 2016 Gold Safety Award for achieving better than industry safety performance on its $153 million New Jersey I-295 Direct Connection project in Camden County. This is Conti’s second time to receive this honor. Liberty Mutual gives this award annually to only 5% of its policy holders, using a stringent scoring profile it has compiled for the construction industry. Conti’s achievement on the I-295 highway/bridge project includes working over 280,000 hours without a lost time incident from June 2014 to September 2016, and maintaining an incident rate 50% better than the Industry.